Add eggs to these homemade dog cookies! 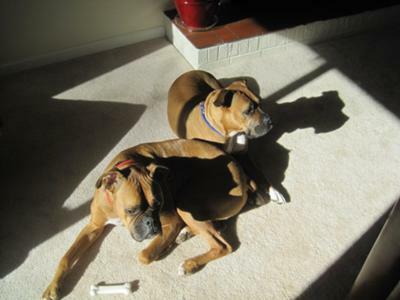 I love this recipe and my 2 boxers, Ben and Emmy, love it more! I am making it weekly because they love it so much. The recipe is fabulous, but needed some tweaks. I doubled the recipe and added 2 eggs, used organic brown rice flour in place of wheat, and substituted 1/2 tsp garlic powder and hot water for the chicken broth. The cookies keep well in the fridge. I made these for my Yorkie/Rat Terrier mix and when they came out of the oven his tail was wagging just from the smell. He LOVES them. What can I substitute for the cheese in this dog treat recipe? I don't feed my dog cheese (let's be honest--it's basically junk food that doesn't belong in an adult dog's diet). Is there anything that you recommend substituting the cheese with? Or can I just leave it out? Thanks!! You could substitute the cheese for an 1/8 cup of ground flax or wheat bran. Is there something else I could use besides oats and wheat flour for this recipe? Chef's Comments ~ That's a great question. You can easily substitute the flour in this and most of our dog treat recipes. A few good grain free flours include almond flour, chickpea flour, potato flour and soy flour. Most of those flours should be available at a major grocery store. As far as substituting the oats, that's a little trickier, but it can be done. The oats are in the recipe for texture and soaking up moisture, so that's what you'll need to replace. First, you will want to halve the amount of oats and add an extra 1/2 cup of flour (or a mixture of the previously mentioned flours). Then you can add a 1/2 cup combination of unsweetened coconut, chopped peanuts and crumbled almond crackers. Or, you could replace all of the oats with the flour mixture. Can I use fresh/raw spinach instead of frozen? If so, does it still need to be microwaved? Chef's Answer ~ That's a great question! :) I haven't tried this recipe with fresh spinach, but I don't see why it couldn't work. If you minced the spinach very fine, my guess is that you would not need to microwave, or otherwise cook, the spinach before adding it to the dog treat dough. Comments for Can I use fresh/raw spinach instead of frozen? Is it necessary to store these cookies in a Refrigerator? Since these are cookies, can it be kept in air tight container outside? And how long would it last if this is done? Chef's Comments ~ You can get lots of tips on How to Store Dog Treats on my website. Unless you live in a very cold climate, most dog treats need to be kept indoors, and even better in the refrigerator. My dogs is algeric to grain. What can I use instead of the whole whear flour? My Husky can't have grain. What can I use besides whole wheat flour. You should put more recipes with no grain in them. Chef's Answer ~ You can replace the wheat flour in most of my dog treat recipes with a non-grain flour. For example, any type of bean flour like Chick Pea (Garbanzo Bean) flour, or "flours" from nuts. They are technically nut meals, but they work as flour, for example almond meal. You should be able to find grain free flours at specialty grocery stores, or at health food stores. Very good simple recipe, however wheat flour isn't something I would normally have in my cupboard. Would it be ok to use plain flour or self raising? Chef's Answer ~ Yes, you can use all purpose flour in place of the whole wheat flour. I do not recommend using self-rising flour because it has the addition of baking powder or baking soda added to it. These are things that homemade dog treats do not need.